WASHINGTON, DC, November 1, 2013 (ENS) – To prepare the United States for the impacts of climate change already being felt across the country, President Barack Obama today established an interagency Council on Climate Preparedness and Resilience, chaired by the White House and composed of more than 25 federal agencies. In his Executive Order establishing the council, the President also created the State, Local, and Tribal Leaders Task Force on Climate Preparedness and Resilience to advise the administration and the new interagency council on how the federal government can respond to the needs of communities coping with the impacts of climate change. 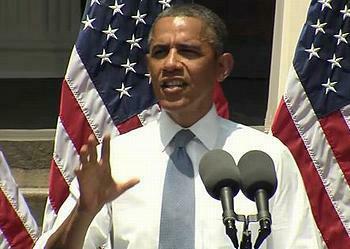 “The impacts of climate change – including an increase in prolonged periods of excessively high temperatures, more heavy downpours, an increase in wildfires, more severe droughts, permafrost thawing, ocean acidification, and sea-level rise – are already affecting communities, natural resources, ecosystems, economies, and public health across the Nation,” said the President in today’s Executive Order. “These impacts are often most significant for communities that already face economic or health-related challenges, and for species and habitats that are already facing other pressures,” he said. 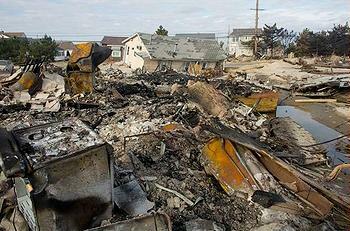 Many see the President’s moves in relation to Superstorm Sandy that devastated the Atlantic coast on October 29, 2012. Congressional Republicans offered no comments at all. Reaction from environmental groups was immediate and supportive. Since President Obama took office in 2009, more than 30 federal agencies have developed their first-ever Climate Change Adaptation Plans, outlining strategies to protect their operations, programs, and investments to safeguard public resources in the face of climate change. In the wake of Hurricane Sandy, which struck the Atlantic coast on October 29, 2012, the administration has provided resources to rebuild the affected area to be more resilient than before, including support for more climate-resilient roads and infrastructure, and projects that protect drinking water and buffer communities from flooding. Now under the new interagency council and task force, agencies will examine their policies and programs and find ways to make it easier for cities and towns to build smarter and stronger. Agencies will identify and remove any barriers to resilience-focused actions and investments, offering grants and technical assistance in sectors from transportation and water management to conservation and disaster relief. The Executive Order directs agencies to identify changes that must be made to land and water policies, programs, and regulations to strengthen the climate resilience of watersheds, natural resources, and ecosystems, and the communities and economies that depend on them. Federal agencies will also evaluate how to better promote natural storm barriers such as dunes and wetlands, as well as how to protect the carbon sequestration benefits of forests and lands. The Executive Order instructs federal agencies to work together and with information users to develop new climate preparedness tools and information that state, local, and private-sector leaders need to make smart decisions. Agencies will make federal climate data accessible to the public through an online portal. The Executive Order builds on the first-ever set of federal agency climate adaptation plans, released earlier this year, and directs federal agencies to develop and implement strategies to evaluate and address their most significant climate change related risks. Task Force members are governors, mayors, county officials and tribal leaders, representing communities large and small from all areas of the country. However, most are Democrats. Mayor Bob Dixson (Greensburg, KS) – No political party identified. After a hurricane leveled the town in 2007, it was rebuilt and now uses 100% renewable energy. Mayor George Heartwell (Grand Rapids, MI) – No political party identified. In 2012 Mayor Heartwell won the top Climate Protection Award from the US Conference of Mayors. Mayor Patsy Parker (Perdido Beach, AL) – No political party identified. Mitigating the BP oil spill of April 2010 has been her the biggest challenge.